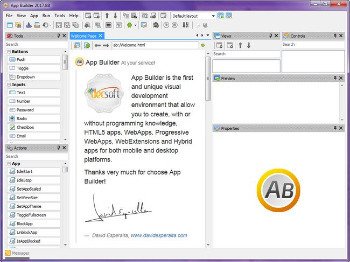 App Builder is an advanced yet user-friendly software utility whose purpose consists of helping people create their own HTML5 programs, even if they lack advanced knowledge in the field, as they will not be required to write a single line of code, if they do not want to. App Builder provide us with dozens of visual and non visual controls we can simply drop it in the application’s designer. Timers, HTTP Clients, Text Inputs, Push Buttons and many more controls ready to use. In what concerns its appearance, the tool may seem a bit cluttered at first, seeing how all of its panels, ‘Tools’, ‘Actions’, ‘Objects’, ‘Views’, and others, are displayed on the right, left and lower edges of the main window, thus leaving little space for the working area. However, all the panels can be pinned or unpinned from the window, allowing users to place them anywhere on the screen. Once developers figure out which components they have the most use for, they can easily close all others. With the help of the ‘Tools’ and ‘Actions’ panels, users can insert various ‘Containers’, ‘Buttons’, ‘Inputs’, ‘Contents’, ‘Tasks’, ‘Databases’, ‘Media’, ‘Non-Visuals’ or ‘Design’ elements, as well as ‘Timer’, ‘Views’, ‘Control’, ‘Arrays’, ‘Watcher’, ‘Variables’, ‘Sensors’, ‘Strings’ and other ‘Functions’, with just a click on the targeted item, then on the working area. Each new item can be customized in terms of ‘Behaviour’, ‘Style’, ‘Hover’ and ‘Focus’ preferences. Once users consider they have finalized their application, then have the option of debugging it, from the ‘Run’ menu, to identify any possible issues, then they can ‘Build’ it, generating the output result. Allows to establish a background and foreground icons for the Android platform. App Builder resize these iccons in the proper way and link it into the Cordova’s config.xml file, in order to get an adaptative icon for the supported Android versions. The already existing app’s icon is used as fallback for Android platforms that don’t support adaptative icons. Fix an introduced bug in some previous release in order to properly change the app’s icon image when the used editbox changes (we select a new icon). Establish the min SDK option for Android to 19 and the target platform to 28. This is required due to some changes in the recent versions of Apache Cordova.